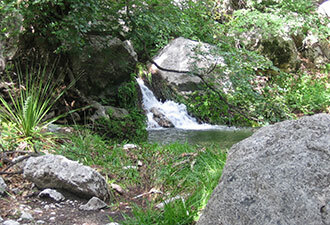 Imagine a quiet day in a rare and spectacular place: a small waterfall cascades past fern-covered rocks . . . ribbons of sunlight beam through a mixed forest canopy of deciduous and coniferous trees . . . native vegetation and ancient stone flash with unexpected color. Now, imagine all of that in the forbidding Chihuahuan Desert of west Texas. Impossible? Not in Guadalupe Mountains National Park, a remarkable island of nature, wild and alive in a vast desert. Guadalupe Mountains safeguards the world’s most extensive and well-exposed fossil reef of the Permian Period, a quarter-billion years old. More than 500 kinds of fossils have been found in the park. Some are on display in the park visitor center. Others await discovery along park trails. Such biological diversity lives on the present, only in different form. Ecosystems range from sand dunes and cactus-studded hills in the park lowlands to the remnants of an Ice Age forest of Douglas fir and ponderosa pine at the highest elevations. Guadalupe Mountains protects plants found nowhere else, such as the Guadalupe violet. It also is a haven for rare animals, with peregrine falcons, spotted owls, black bears and horned lizards roaming unhindered. An abundance of birds – more than 300 species visit, nest, or live in the park – makes for rich bird-watching. As the largest federal wilderness area in Texas, this is a largely undisturbed landscape. Look around: The rugged countryside is much like what the Mescalero Apache, the Spanish conquistadors, the Buffalo Soldiers and early white settlers found when they arrived. It is rich in history and natural beauty. Although the park is an easy drive from metropolitan El Paso, Texas (90 minutes, 110 miles) and Carlsbad, New Mexico (one hour, 60 miles), once you arrive at Guadalupe Mountains, the park is best enjoyed on foot. The view is magnificent as you approach. The scenic drive ends once you come inside, where more than 80 miles of trails await both day-trippers and weekenders, from easy strolls to demanding treks. The shortest – the paved, wheelchair-accessible Pinery trail – peeks into the 19th century, including station ruins of the famous Butterfield Stage. The well-groomed route up 8,749-foot Guadalupe Peak, the highest point in Texas, is a strenuous challenge that rewards hikers with an amazing view. 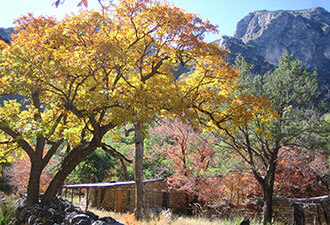 On the McKittrick Canyon trail, remnants of autumn’s brilliant colors may linger in late fall. If you plan a weekend stay, lodging and food are available an hour away in Carlsbad. 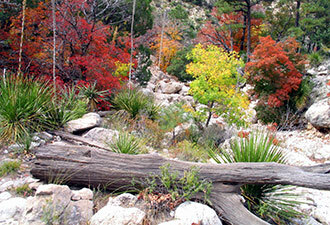 But Guadalupe Mountains is an inviting spot to camp. Park campgrounds at Pine Springs and Dog Canyon accommodate both tents and RVs. Pine Springs is a great jumping-off point to the southern half of the park. Dog Canyon, on the park’s north side, offers incredible solitude. For Guadalupe Mountains at its wildest, hikers can camp in the backcountry. Drop by the park visitor center for your free, required backcountry permit. And don’t forget plenty of water in your backpack! This special destination is rugged and challenging. The backcountry is dry. The trails are often rocky and steep. Supplies are an hour’s drive away. Come prepared to get away from it all, and the rewards of Guadalupe Mountains National Park – scenic, natural, psychological – are abundant. Just imagine!